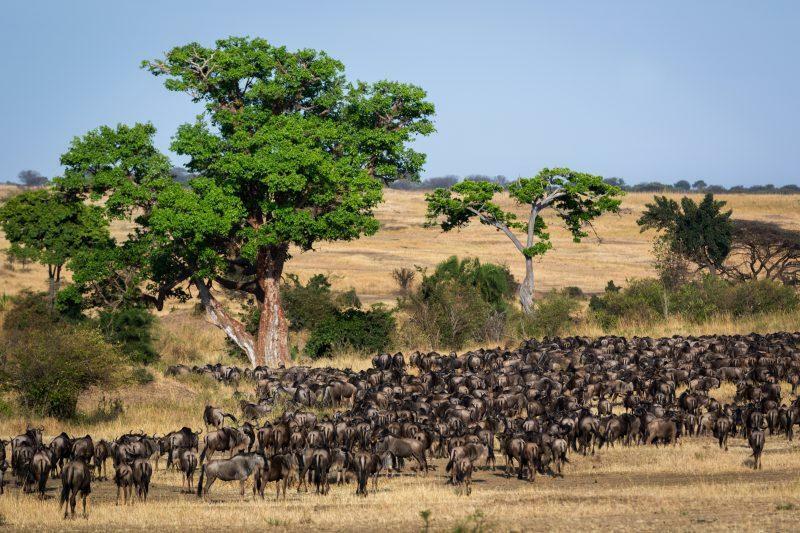 The Wildebeest Migration sees not thousands or even hundreds of thousands of animals making the perilous trip between the Serengeti and the Maasai Mara, but millions! Zebra, gazelle, and wildebeest make up the bulk of this migration, but behind them are the predators looking to pick off the stragglers. 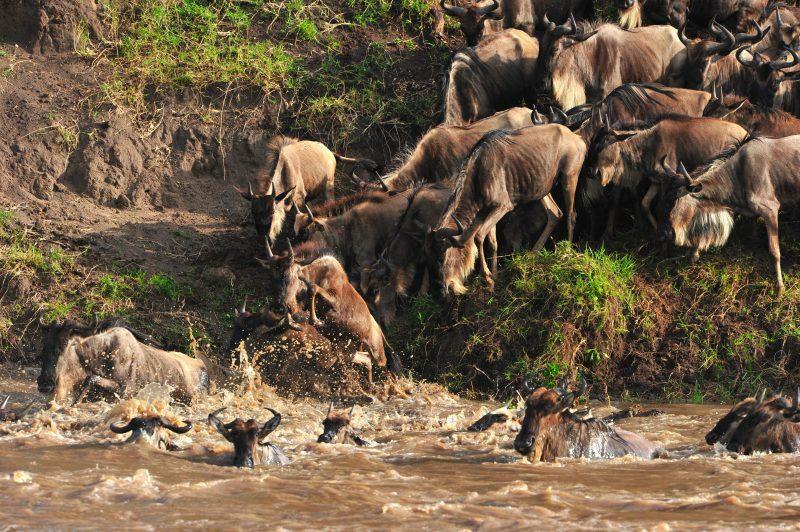 But what is the best time to see the Wildebeest Migration? 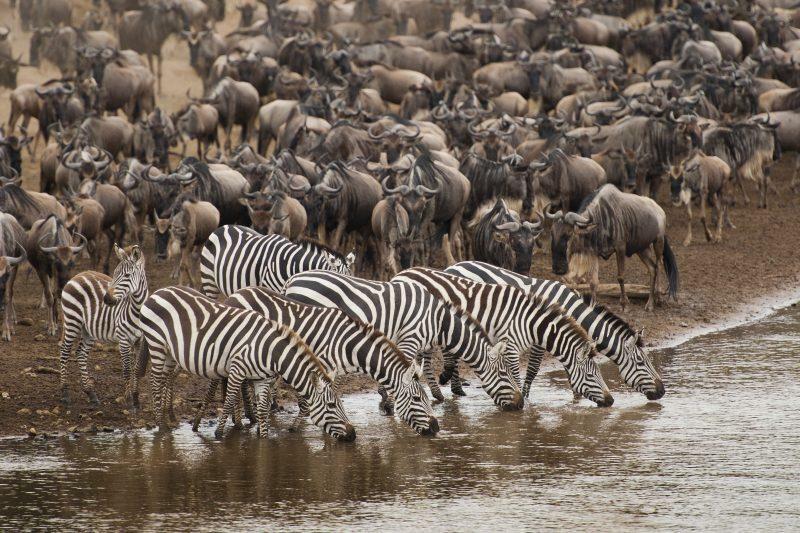 Whether you witness its beginnings during calving season in Ndutu, the spectacular river crossings on the Mara River, or the return journey from Kenya’s Maasai Mara, you are witnessing one of the wonders of the natural world – a migration that covers a huge distance and sees almost 250,000 wildebeest perish each year. When it comes to capturing the rhythms and the almost casual mortality of life for Africa’s herbivores, the Wildebeest Migration offers a stunning and sometimes confronting window into the realities of life on the plains of Africa. 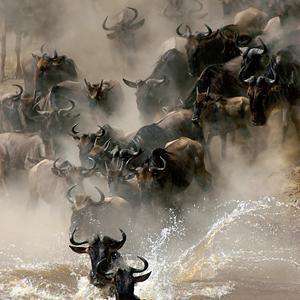 The Wildebeest Migration is an annual migration of wildebeest from the Ndutu region of the Ngorongoro Conservation Area/southern Serengeti in Tanzania to the Maasai Mara in southern Kenya. From December until March, the recent rains leave the stunning caldera reserve with an abundance of grass for zebra and wildebeest to feast upon, and it is at this time of year that the wildebeest calving season begins. It is also an opportune time for predators such as lions, cheetahs, leopards, and even hyenas to pick off weak and confused calves. When the rains end in April/May, the zebra begins the process of heading north towards the Maasai Mara. Where the zebra go, the wildebeest follow. Once the crossings are complete, the herd settles in the Maasai Mara in Kenya. After remaining in the more fertile Mara for the duration of the dry season, the migration heads south again in preparation for another calving season in the New Year. 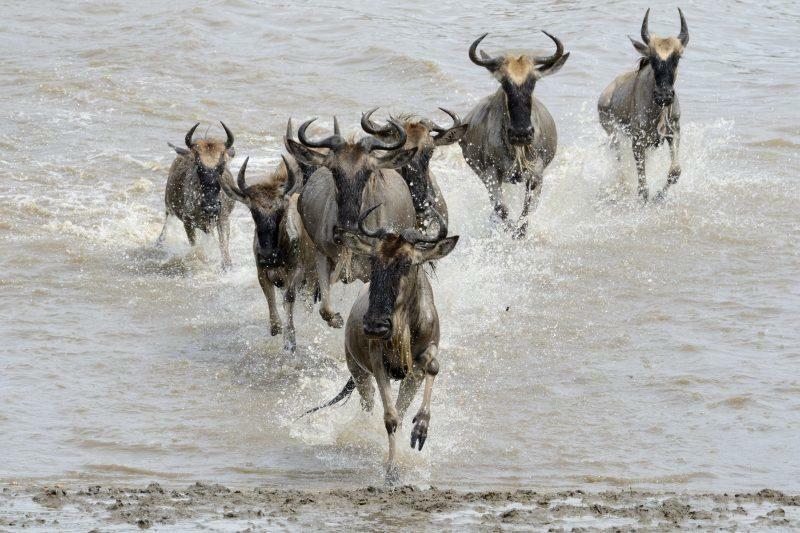 The exact timing of the Wildebeest Migration is completely dependent upon rainfall patterns, making it a difficult thing to predict with any certainty. A particularly heavy or light rainfall might completely alter the movement of the massive herd. This can make planning your safari an occasionally complicated affair, so it pays to spend as much time as possible in the Serengeti so that you can adjust to the sometimes mercurial movements of the herd. As unpredictable as the herd can be, there is a rough calendar that gives the Shadows of Africa team an idea of where the action will be at any given time of the year. The beauty of our private safaris is being able to adjust on the fly, and our experienced guides will go above and beyond to give you every chance of seeing the herd in motion. Each year, life begins for a huge number of animals on the fertile plains surrounding Lake Ndutu and Lake Masek. On any given day, more than 10,000 wildebeest come into the world and take their first awkward steps on the long road north. Over the course of a few short months, more than 1,000,000 wildebeest will join the already vast herd and feast on the lush grass that springs up from volcanic soil well-watered by the rainy season. The Calving Season is best spent in the Ndutu region of the southern Serengeti, and a number of tented camps and lodges spring up each year from December through until March to accommodate the demand for a front row seat. The calving season isn’t as dynamic as later months, as the herd has ample food and the relative safety of wide open plains to help them spot would-be predators. Recommended Itinerary: Five Day Calving Season Safari. As food becomes more scarce in the south due to the drier weather and the growing number of mouths to feed, the first zebra begin to make their way north. The Wildebeest Migration begins with some 1.7 million wildebeest, almost 500,000 antelope, and a quarter of a million zebra. Their first stop? Seronera in the very heart of the Serengeti. The Seronera region offers excellent game-viewing throughout the year, but at this time of year, the big cats and wandering elephants are complimented by the passing herd. Green Season is the perfect time to plan your safari if you’re on a budget. With the evening rains keeping the tourist crowds away, luxury lodges lower their rates to a level that makes them as cheap as camping out on the plains. 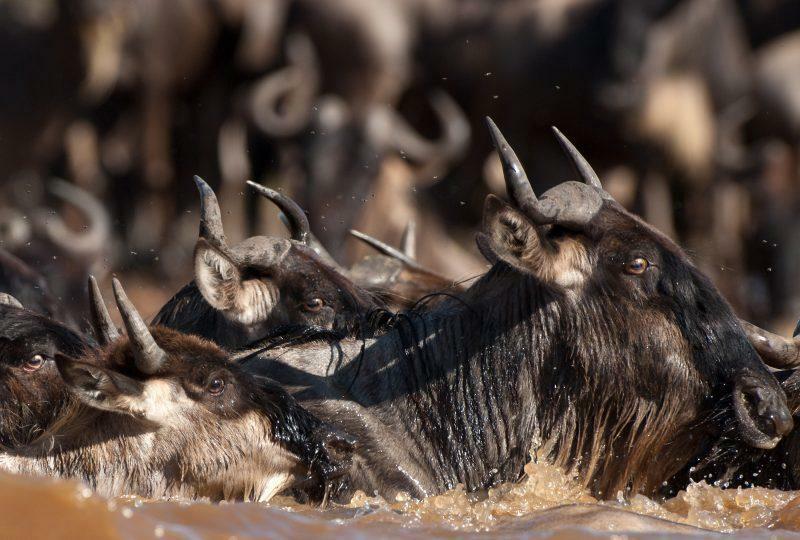 Recommended Itinerary: Five Day Wildebeest Migration Safari or Six Day Big Five Safari. 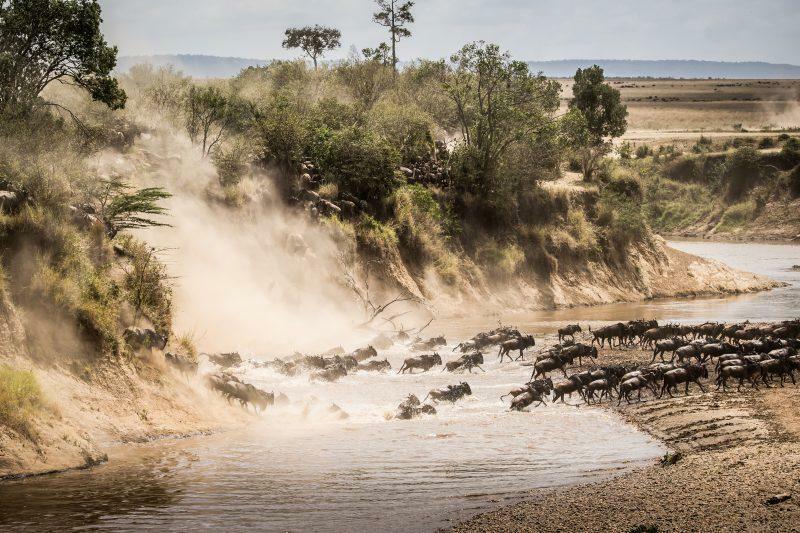 The Mara River crossing may be the most well-known highlight of the Wildebeest Migration, but the Grumeti River crossing in the Western Serengeti is no less spectacular. Drawn towards the shores of Africa’s largest lake, Lake Victoria by the promise of rain and better grazing, the herd deviates into the west. The only thing standing between the herd and the large freshwater lake? The Grumeti River. 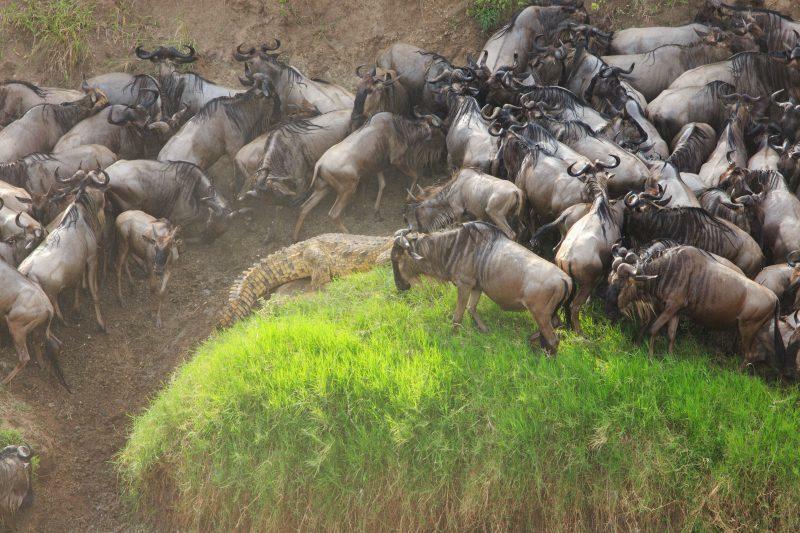 Some of the most spectacular images of the predator-prey dynamic are captured in and around the river, with both the big cats and Nile crocodiles seizing upon this opportunity to strike at the increasingly desperate members of the herd. The Grumeti is home to the largest Nile crocodile population in the region, and these opportunistic predators make the most of things. 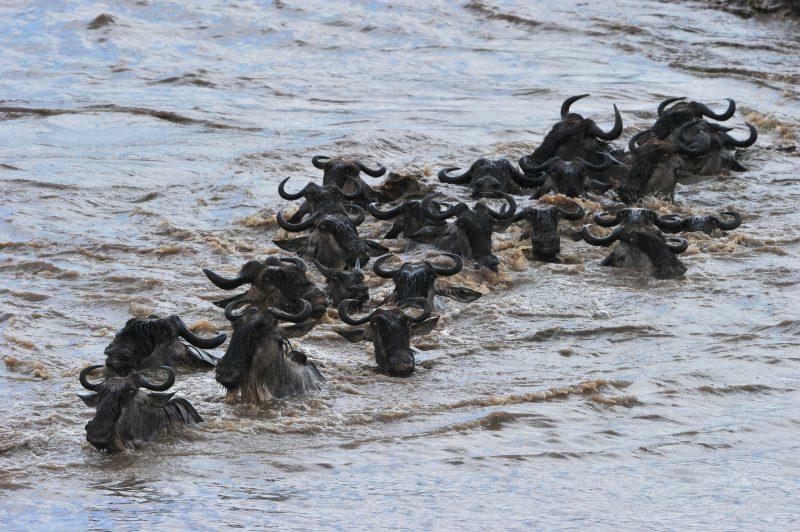 During this period, the herd continues its movement north towards the Maasai Mara National Park in Kenya. There is no tight schedule that these animals follow, so tracking the herd’s movements becomes a day to day prospect as the meander slowly but inexorably towards the next big obstacle in their path: the Mara River. 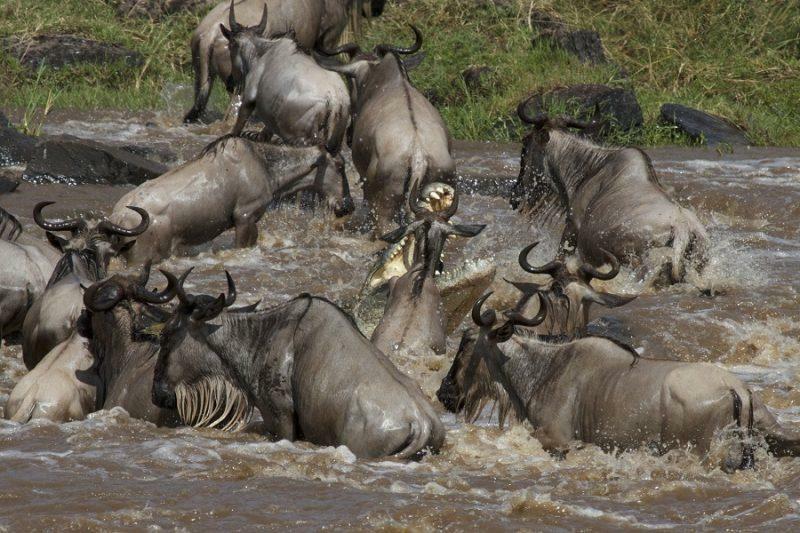 The Mara River poses another deadly barrier for the herd, who must again brave swollen waters and the opportunistic predators if they are to find relative safety on the far side. Photographers and documentarians from around the world gather to witness the death-defying crossing, but the surrounding landscapes are every bit as memorable as the life and death struggle taking place at the Kogatende crossing. 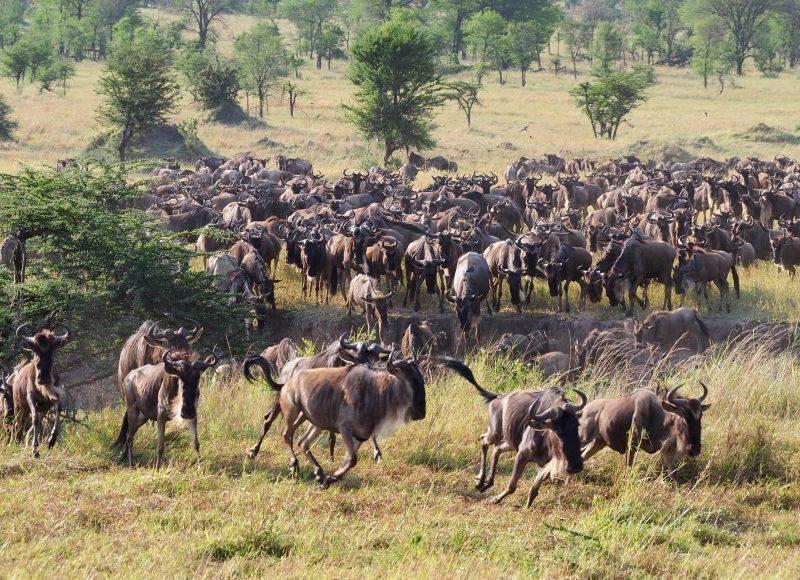 Tanzania surrenders its claim to the Wildebeest Migration for a few months at the end of each year. 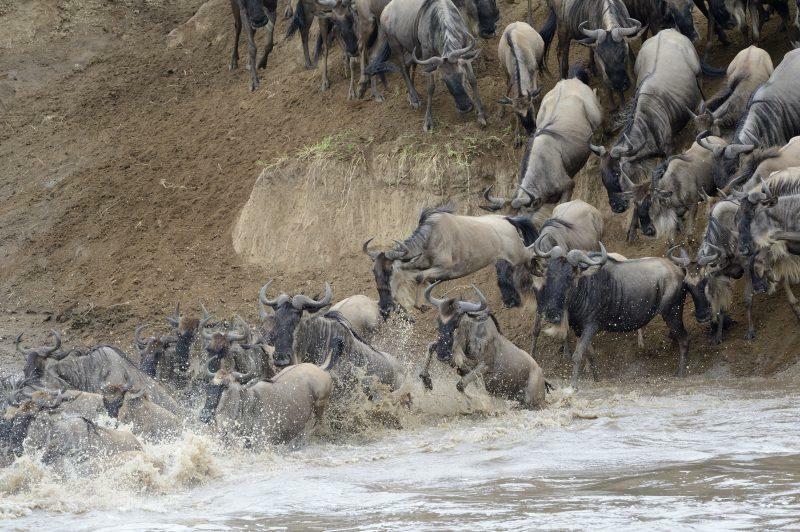 The herd passes across the Mara River and eventually makes its way into the Maasai Mara in southern Kenya. For visitors coming to Africa in the later months of the year, the Maasai Mara offers the best chance to see the herd in motion. River crossings can still take place on any day, whether it’s stragglers coming into Kenya or confused wildebeest crossing back over temporarily. 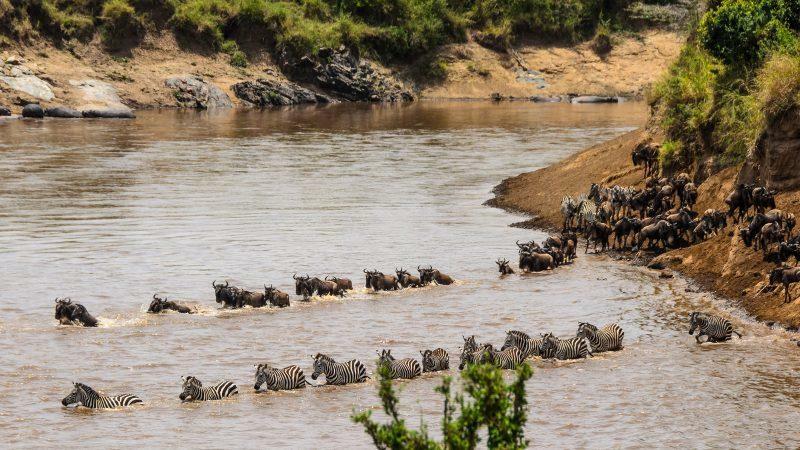 Things calm down considerably once the Wildebeest Migration has crossed back over the Mara River into Tanzania, with the herd able to be spotted in Kogatende, Lobo, or the Central Serengeti as it makes its way back south. November is a great time to visit and take advantage of low-season pricing, while Decemeber segues nicely into the calving season. 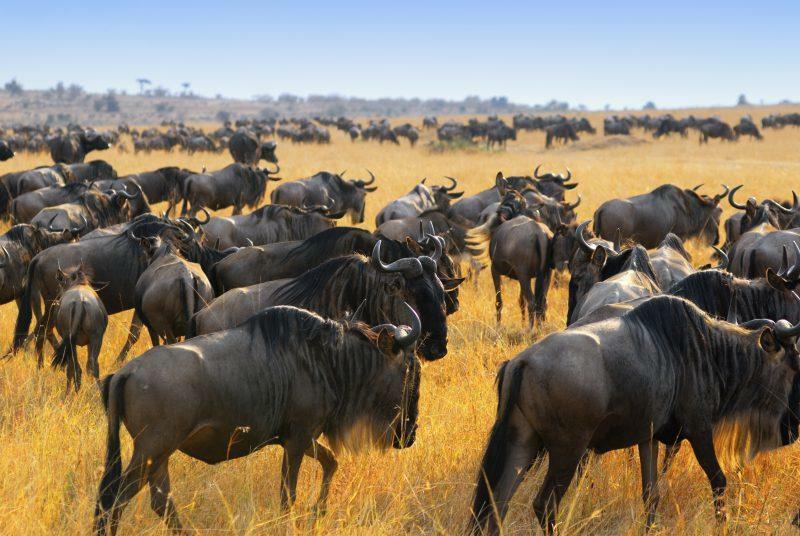 Regardless of the time of year you choose to visit East Africa, there’s a chance to see the Wildebeest Migration. June through September offer up the most dramatic images due to the river crossings, but prices at this time of year tend to be higher as more and more tourists flock into the country. For those wanting to save a few dollars, coming in November into Kenya or April/May in Tanzania offer luxury lodges at substantially reduced rates. This entry was posted in Tanzania Attractions, Tanzania, Tanzania and tagged wildebeest migration kenya, wildebeest migration tanzania, when to see wildebeest migration, best time to see wildebeest migration, wildebeest migration serengeti, wildebeest migration masai mara, wildebeest migration safari, wildebeest migration itinerary, wildebeest migration kenya tanzania, wildebeest migration tour, wildebeest migration calving season, wildebeest migration river crossing, when to see river crossing wildebeest migration, best time to see wildebeest migration river crossing, wildebeest migration kenya or tanzania, wildebeest migration western corridor, wildebeest migration northern serengeti, where to stay wildebeest migration.